Lake Brienz knows how to amaze people. With its turquoise color, people from all over the world fall in love with this lake – including me. 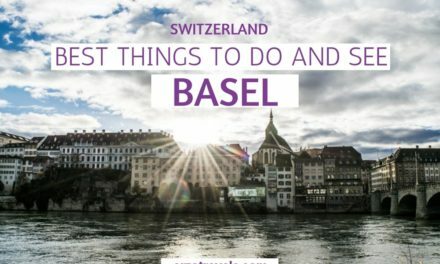 It is for sure one of the most beautiful lakes in Europe, and actually, it is also one of the best places to stay in Switzerland. While there are more sights around Lake Thun, Lake Brienz is still my favorite. 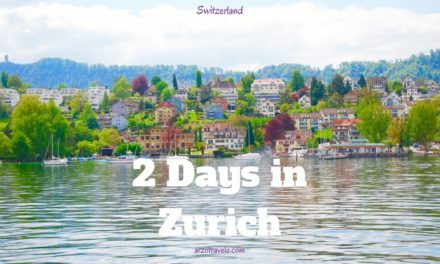 With cute towns on its shores, an interesting color, waterfalls, and more, it is a place that should be on any Switzerland itinerary (if you are curious what to do around Lake Thun, read my post here). 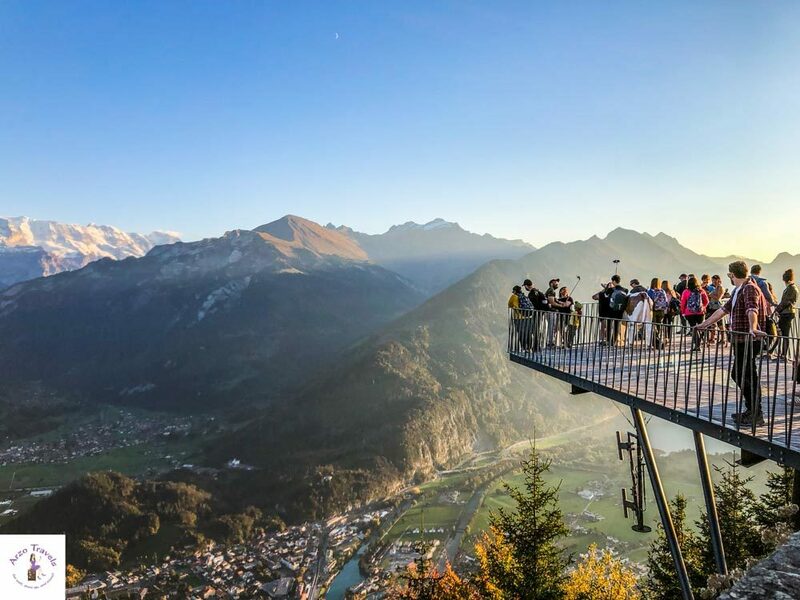 If you stay in an official accommodation in Interlaken or in the area, you will get the Interlaken Guest Card that gives you discounts on certain activities. You can also use public transportation in Interlaken and its surroundings for free (usage is limited though). Personally, I prefer staying in the area around Lake Thun a bit more. But Interlaken is a great place to stay, it is central, busy and you get to many attractions easily. If you stay around Lake Brienz my tip is the Grandhotel Giessbach (it is closed ruing the winter time, but if it is open it is just something totally unique and my personal top tip for two or three nights). Besides the above-mentioned hotel, Victoria Jungfrau is a popular luxury hotel right in the heart of Interlaken. Click here to get the best deals and find out more. There is teh option to book an Airbnb apartment/room as well. If you are a first-time Airbnb user you get a discount if you use my link, so click here to save money $$$. Click here to read my full Interlaken accommodation guide. Lake Brienz makes it a joy to drive, ride, or walk around. It doesn’t really matter if you get around via car, public transportation, cycle, or just on foot because each of these modes is fantastic for getting around the lake (and I should not forget boats as a great way to get around – more on that later). 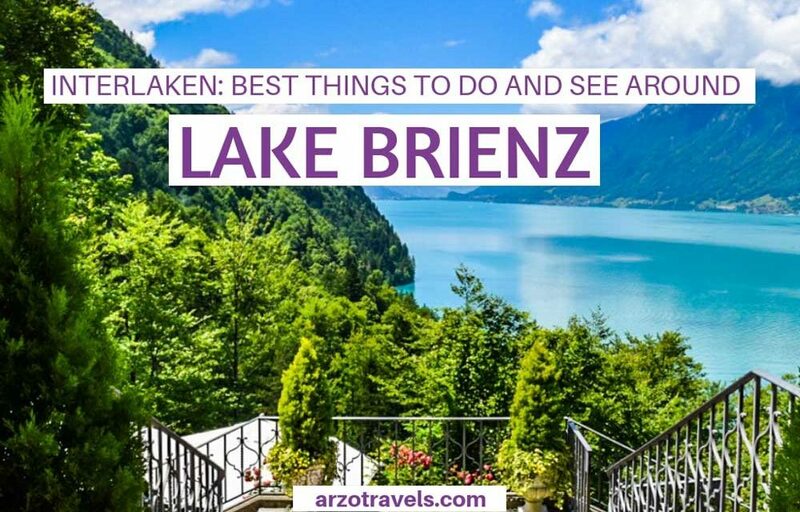 Find out more about the Brienzer See – as Lake Brienz is called in German – and the best things to do around Lake Brienz, as well as some important travel advice. Lake Brienz is located in the region of Bernese Oberland, in the German-speaking part of Switzerland. 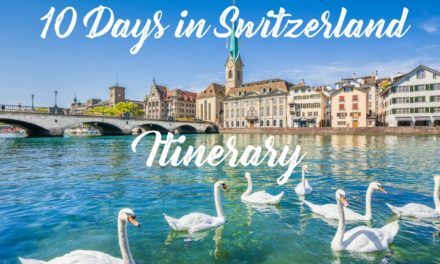 It is about an hour away by train or car from Lucerne and flanked by Brienz on the northern shores, as well as Interlaken on the southern shores. The lake is primarily fed by the Aare River, the Lütschine River, and the Giessbach Waterfalls. The water is so low in nutrition that there isn’t much sea life. However, it is also very cold and not the first choice for swimming. 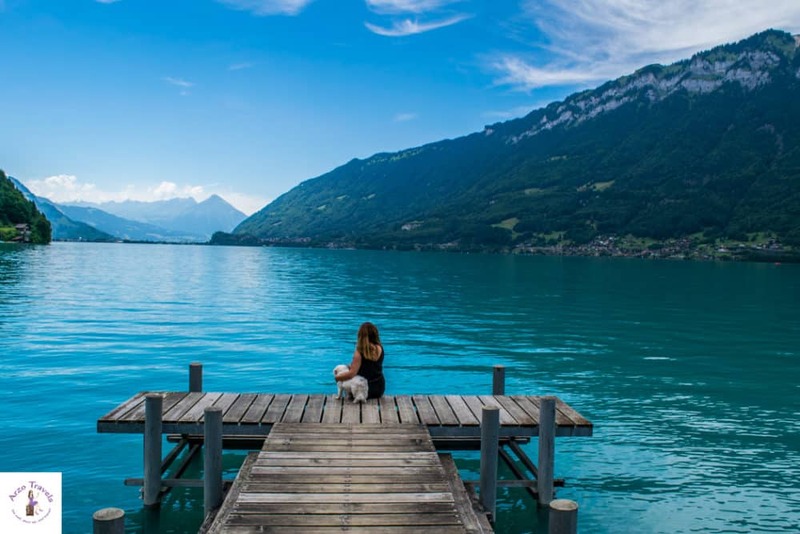 Until the 10th century, Lake Thun and Lake Brienz were one lake. After the separation, each became its own beauty, and while I wonder what it once looked like, I appreciate having two jaw-dropping lakes. It wears its best color when the sun shines – its turquoise color makes this lake one of the prettiest ever. And with about 30 kilometers of shoreline, there are several cute villages and towns nearby that offer fun activities to do. If you are looking for the best tip for Lake Brienz, my answer is easy: cruising Lake Brienz on a boat. I can‘t remember how often I have cruised Lake Brienz, but I am sure I will never get tired of it. Even if you aren’t the biggest boat lover, this is probably one of the prettiest cruises you can take (the highlight is passing the Giessbach Waterfalls). 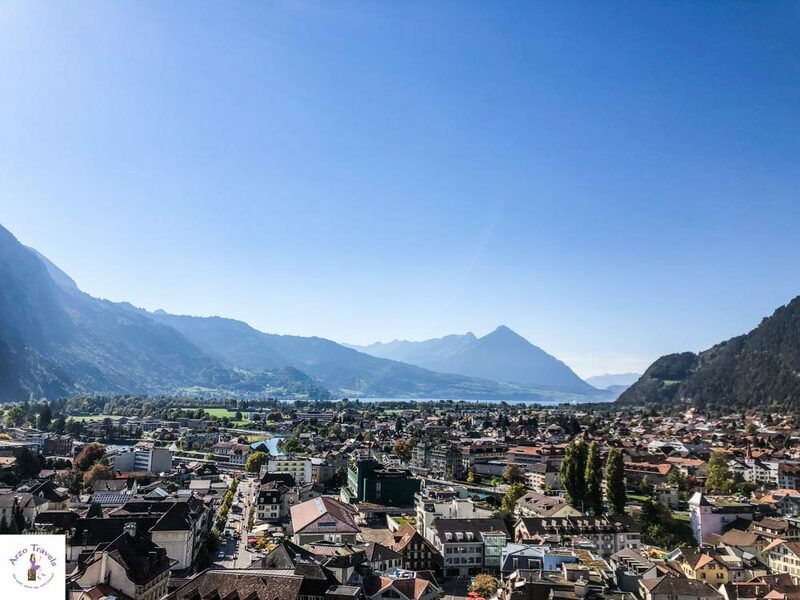 Whether you start from Interlaken or Brienz, you will see the lake and its scenery from an amazing perspective, and you get a good idea of the geography of the lake and its towns and villages. Getting from Brienz to Interlaken by boat takes about 2 hours. You have the chance to hop off at several stations. Lake Brienz is actually quite cold, so most people prefer swimming in Lake Thun. However, you can go stand up paddling, get around via rowboats, and do some other water sports activities (which I am not very familiar with as I just don’t really do much on the water). Interlaken is the most famous town on the shores of Lake Brienz. The town is known as the world capital of outdoor activities, like paragliding, but it also offers interesting places for those who are less into outdoor activities. 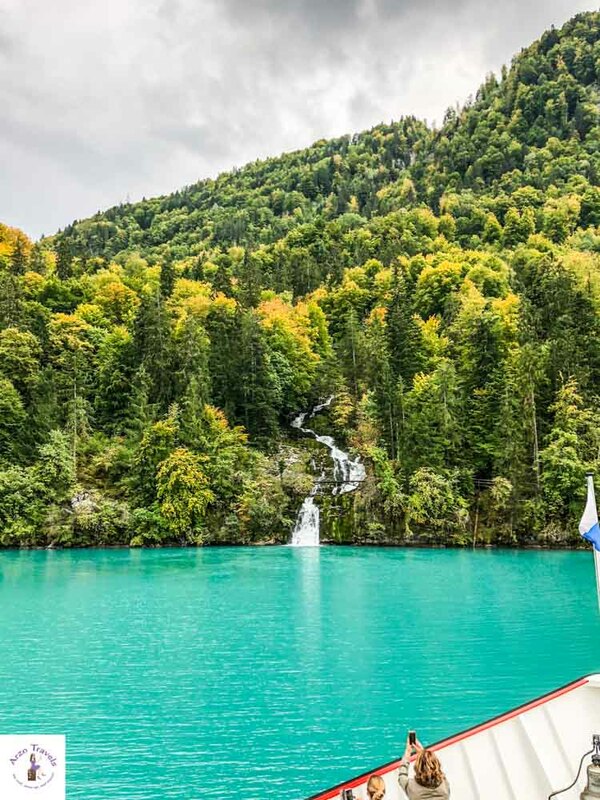 Lake Brienz is also perfect for beautiful strolls and hikes. I haven’t walked all of Lake Brienz yet, but parts of it (from Giessbach Waterfalls to Iseltwald e.g) and walking directly along the shores is one of the most fun activities in Lake Brienz. So whether you are more ambitious than me (and walk the whole lake) or just do some hiking – you will surely enjoy both. On the northern shore of the lake lies this idyllic village: Brienz. The village’s 18th-century wooden chalets make you feel like you have been beamed back in time. With the lovely promenade, it is probably one of the cutest places at Lake Brienz. Getting around Lake Brienz is not just a necessity, it is fun. 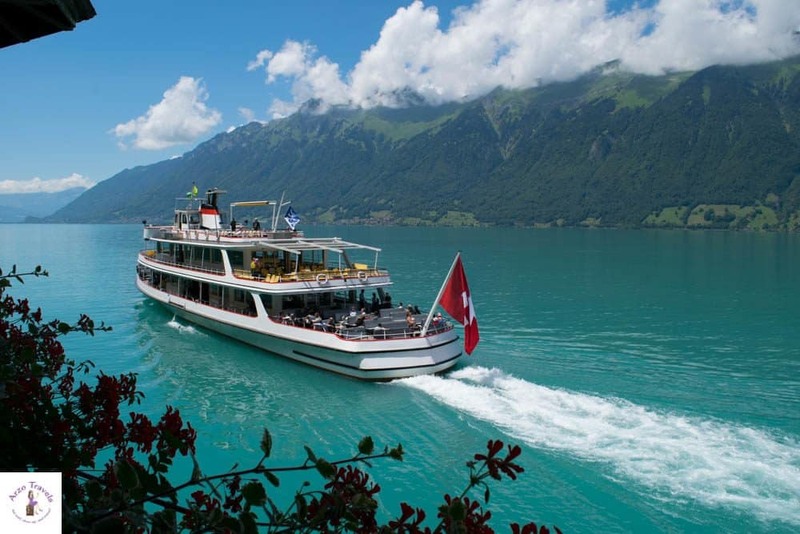 So, I also added “How to get around“ as one of the best activities on Lake Brienz. 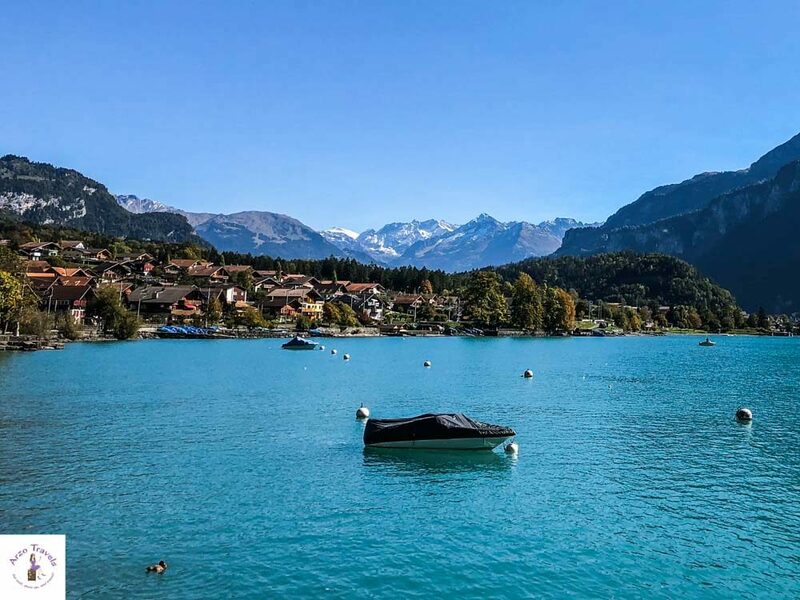 If you enjoy driving, you will love driving along the shores of Lake Brienz. Though driving along Lake Thun is probably more scenic, Lake Brienz is also perfect for nice window views. Tip: for the best views, drive from Interlaken to Brienz. The lake is not always visible from the window view, however, you get a few great views. 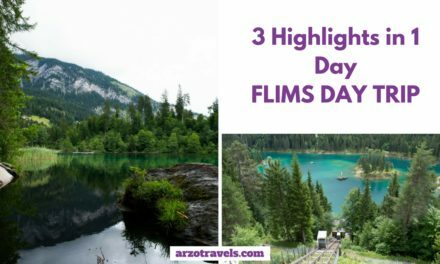 Once in Brienz, you can experience another Lake Brienz highlight: Getting up Brienzer Rothorn. 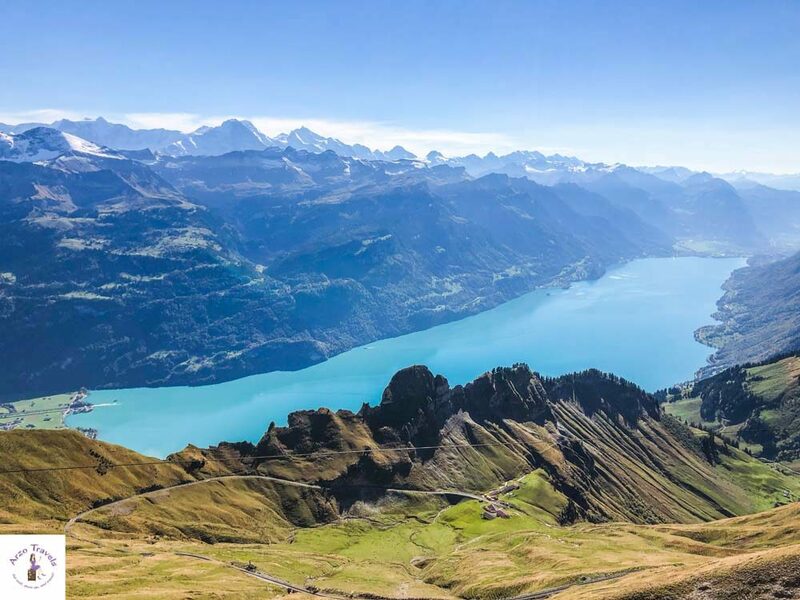 While you could hike up, using the old locomotive to enjoy the mountain views of Brienzer Rothorn, which is 2,100 meters above sea level, is a must-do on a clear day. The lake is almost always in sight while going up. The Giessbach Brook tumbles in 14 stages over a length of 500 meters and then flows into Lake Brienz. For the best view, head over on a boat or just hike up to the waterfall – at some point you can even go behind the waterfall. 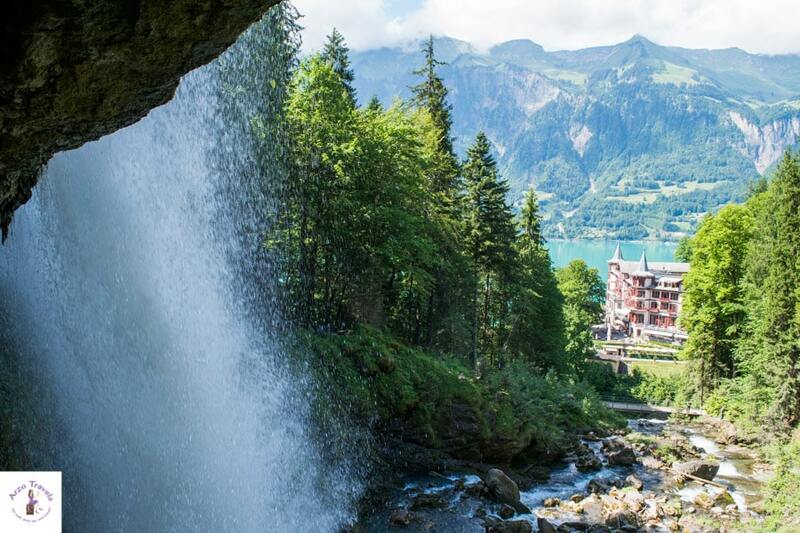 You will have a view of the Grandhotel Giessbach and the lake. 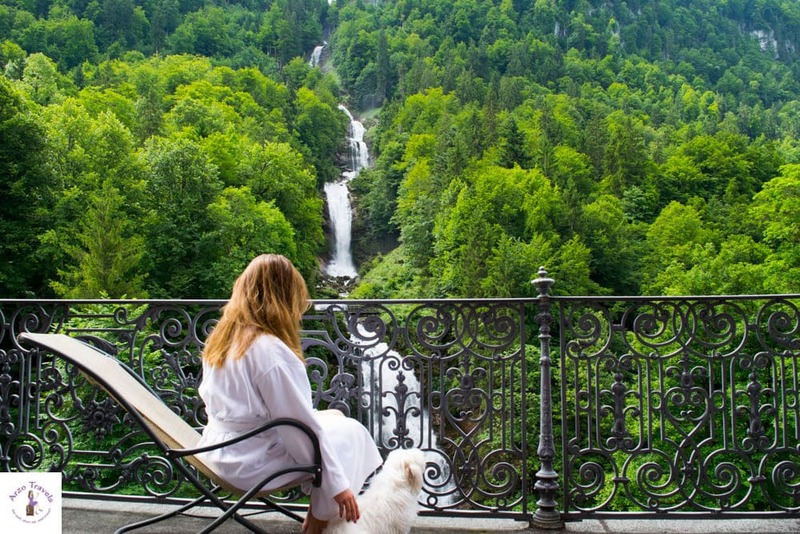 The hotel is a beautiful luxury hotel – if you can, I recommend booking a room at Giessbach Hotel in Brienz with a waterfall view. The hotel is closed in winter, but you can enjoy the waterfall view even if you don’t stay at the hotel. Iseltwald is another adorable village on the southern shores of Lake Brienz. The pier has become a popular photo motif, but walking by the traditional Swiss houses feel authentic – despite the tourists. Get here by Postauto, car, or boat – or walk to Iseltwald from the Giessbach Waterfalls. I haven’t cycled Lake Brienz, but it has become a bucket list item because cycling around the lake is probably pure bliss. Yes, it is a mountainous area and you might have to pedal a bit harder at times, but with views of Lake Brienz, it should not be too difficult. There are many mountain peaks with great views in the region of Interlaken, but Harder Kulm station is directly linked to Interlaken Ost train station, southwest of the lake. Great views of Lake Brienz and Lake Thun will be your reward if you hike up (or take the funicular). From here, you also have a beautiful spot to watch the sunset (though you should look towards Lake Thun rather than Lake Brienz). Fancy a scenic train view of Lake Brienz? One of the moments I enjoyed most was the train ride from Interlaken to Brienz – views like this make train rides worthwhile. Tip: If going on a train ride, choose the route from Interlaken to Brienz and sit on the window on the right in the direction of travel. Looking for more tips on things to do in Interlaken? Here are 50 fun activities!